The actual size is 2.54 cm high x 1.82 cm wide. I'm hoping that linuxpusher will get some good quality vinyl self-adhesive labels made so that SL users can buy them from his Web shop but, if he cannot, I'll contact another manufacturer of laptop/PC labels and try to get them to manufacturer and stock them. i'll post again in this thread if I manage to get a supplier to produce them for sale. Can I ask those of you who would be interested in buying such a label for your laptop or PC to please post in this thread so that I can get an idea of the demand for such labels. If you'll create a JPG in 200 DPI, and "at minimum" the correct size - I can use that to print (although CMYK colors and in an eps file would probably help with the correct colors). linuxpusher, the reason that the SVG image did not look correct is because you need to install the two TTF fonts AnimalTracks.ttf (http://creamundo.com/index.php?lang=en& ... Tracks+TTF) and ASENINE_.ttf (http://www.dafont.com/asenine.font) that I e-mailed to you but can also be obtained from the links I have given here. I have tried this with Inkscape under both Linux and Windows and it works fine. The design is basically the same as the one I posted earlier except for the "Powered by" at the top, which I made slightly bigger and centred it. If I were getting any more labels printed I would change the colour of the "Powered by" to white, as the red text does not show up as well as the white text in bright light. The labels produced by ScotGold have a very slightly dimpled matt finish and do not show up well in bright light but look OK in diffuse light. 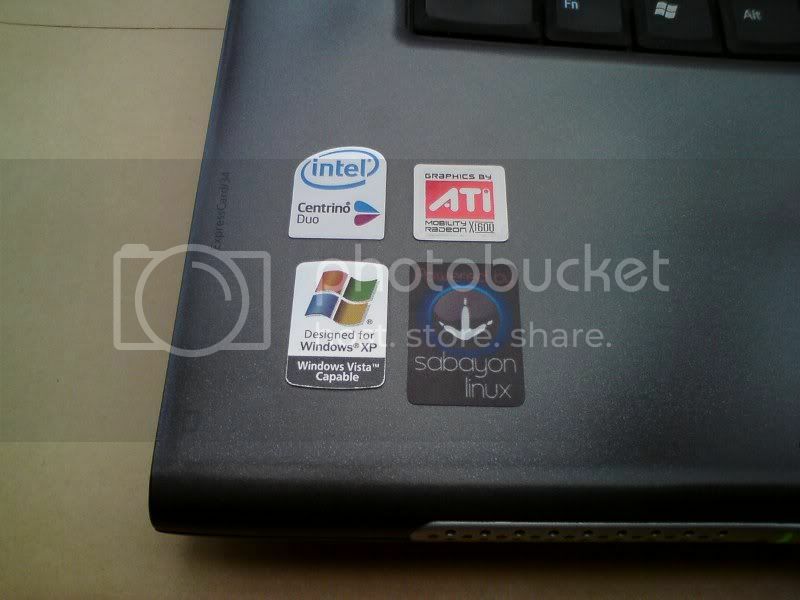 If you want to buy one of these labels for your laptop or PC case then you can contact ScotGold via their Web site: http://www.scotgold.com/ (See their Contact page, and ask them about laptop/PC labels for Sabayon Linux). Their price is very reasonable and they can ship labels all over the world. I bought ten labels as they were so cheap. In order to print laptop/case labels, ScotGold asked me to produce a CMYK JPG file in the actual size at 600 dpi. As I mentioned in a previous post, I used Inkscape to create an SVG file with the label image. 2. I installed the "ttmkfdir" utility using the package manager (Portage in my case, but it's also in Entropy). 4. I logged out and back in again, to restart the X Server. The most difficult part for me was using Inkscape, as I had never used it before. It's not that difficult to use really, but it took me an hour to produce an image that I was satisfied with. 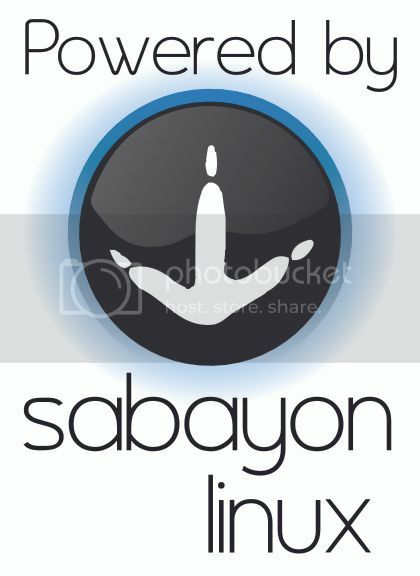 Anyway, I hope you like the result and affix one of these labels to your laptop or PC case to show off to everyone that your machine is "powered by Sabayon Linux"! As mentioned in my previous post, red text does not show up as well as white text on the printed label, so I have now also sent artwork to ScotGold for the two variations shown below. So, if you contact ScotGold you now have a choice of three designs for your laptop label/case badge. 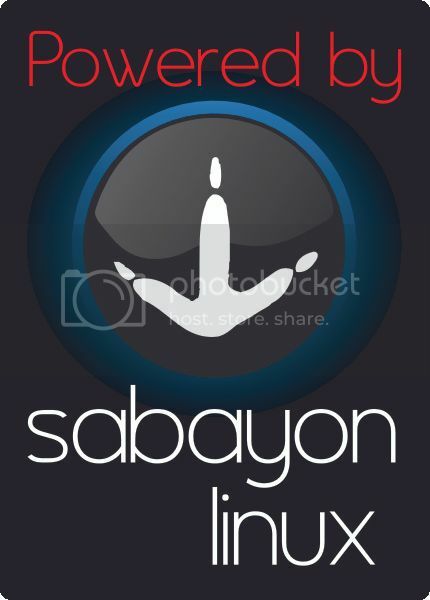 I've given up trying to keep up with the changes to the Sabayon Linux theme; it seems to change almost every release. 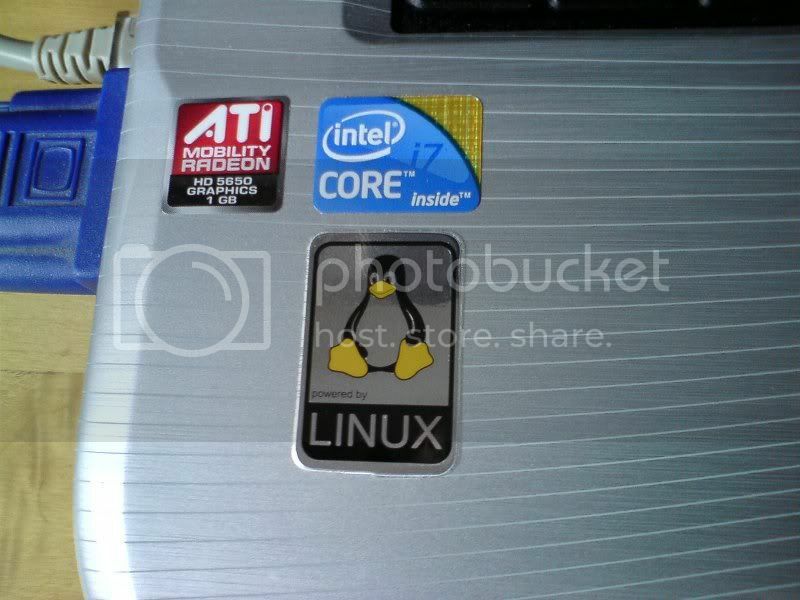 So, for those of you who want to have a "Powered by" laptop sticker/badge, I can recommend the "Tux Case Badges" sold by zareason (http://zareason.com/shop/product.php?pr ... 257&page=1). The price is reasonable and the quality of these labels is very good: aluminium and shiny with crisp graphics. They are nice and thin, and are perfect for laptops, although they would look equally snazzy on a desktop or tower PC. Last edited by giannis12a on Tue Oct 05, 2010 12:24, edited 1 time in total. 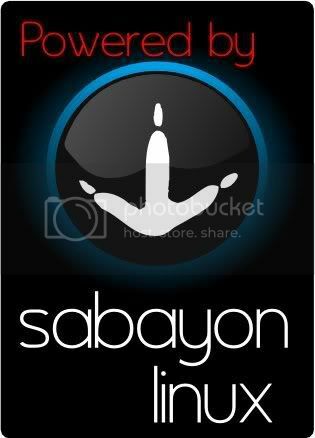 giannis12a wrote: Powered by Sabayon sticker.